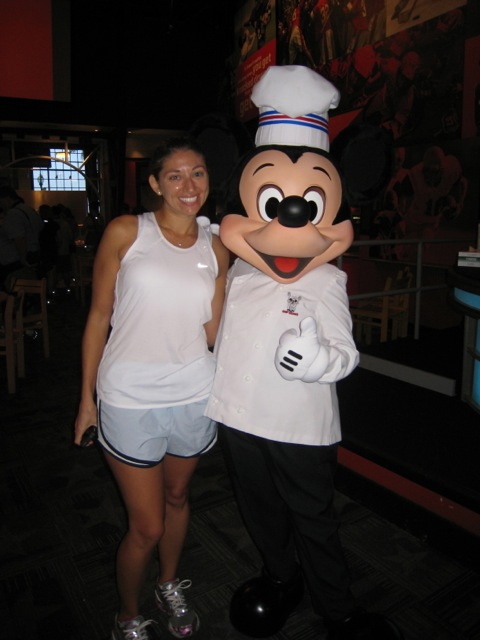 About a week before I was set to leave for Florida for the Wine & Dine Half Marathon (my first race ever!) I was at work waiting for a meeting to start and decided to check Facebook on my phone (shhh! Don’t tell!) 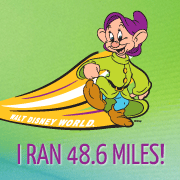 – there was a post from runDisney that said the first 25 people to respond would be invited to a special Meet-Up and Eat-Up event the Friday before the race…I quickly sent my e-mail and just a few hours later I received a reply saying I was chosen to participate! 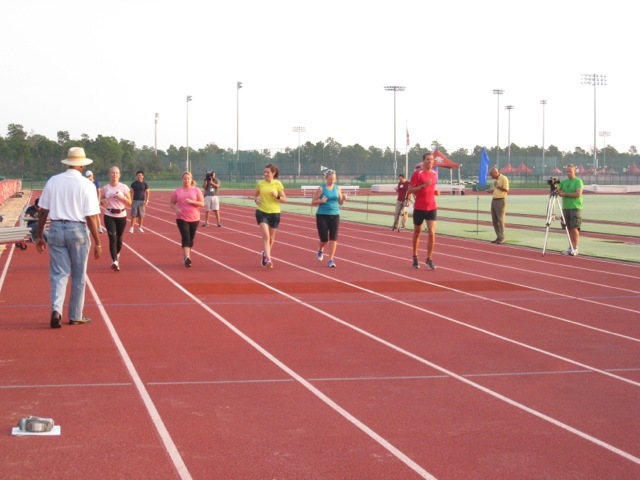 My trip down to Florida was a bit delayed, as you may have read about in my race recap, so on about 4 hours of sleep I got up and took a cab over to the ESPN Wide World of Sports Complex for the 7am meeting time for the event. Once everyone was there Bob Hitchcock, PR Manager for runDisney, gave us a quick rundown of our schedule for the morning and then we all got into golf carts and were driven over to the track where we were met by our first guest speaker of the day, Olympic Track and Field Coach, Brooks Johnson. Mr. Johnson handed out a document called “The Need for Speed” and from there it was a bit like a high school physics class! Inertia = Mass x Velocity and Force = Mass x Acceleration… it was a bit too much physics for me that early in the morning, and I have to say as someone so new to running (at the time I had just started running about 3 months ago) all I was worried about that weekend was finishing 13.1 miles without collapsing so this was all a bit beyond me at the moment. However, that being said Mr. Brooks was a great speaker, very entertaining and funny and I did enjoy when he got us up and had us do a few drills on the track – he really did watch each person and give feedback on their form! After Mr. Brooks spoke we met with 2010 Wine & Dine champions Melissa Wisner and Anton Van Zyl who talked a bit about the course and the challenges of running a night race since it was something new to most people. I was a bit surprised when they talked about the number of hills on the course, I was expecting a race in florida to be pretty flat, I hadn’t realized we were going to have to run up the overpass ramps! Lastly we heard from the Official runDisney Training Consultant, Jeff Galloway, who I was really looking forward to meeting, I had read some of his books and listened to a podcast he was featured on during my training and I really liked his “you can do it” approach to running, it was very motivating for a new runner looking to jump right in to doing a half marathon. Jeff handed out a document with articles on “Eating and Drinking BEFORE an Evening Event” and “Recovering After a Night Race”. He talked a bit about the information in the articles and did a bit of Q&A and then it was time to head off on a run! There were two groups for the run – one straight running group that was let by Anton and Melissa and one run-walk-run group led by Jeff Galloway. While I wasn’t planning on using Jeff Galloway’s run-walk-run method for the half marathon the next day I decided to go with Jeff’s group – how often is it you have the chance to run with a former Olympian! The run was a 2 mile loop through the grounds of the Wide World of Sports, Jeff kept a very comfortable pace and the whole group stayed together and chatted the entire time. 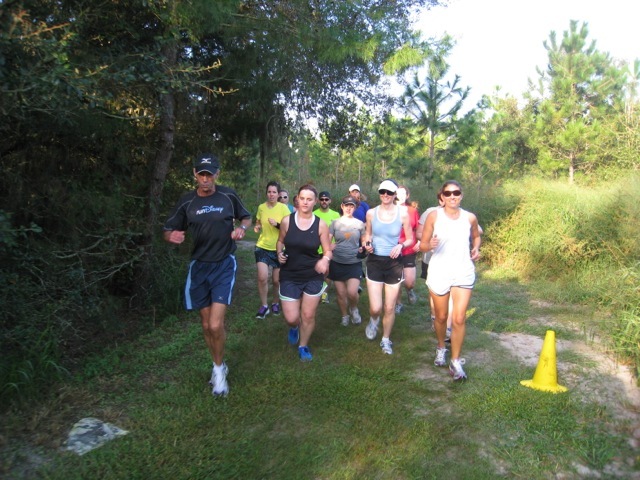 Jeff was extremely personable, answered everyone’s questions and really made the run a great experience – I was just glad I brought two pairs of sneakers to Florida with me, it was a trail run and the pair I had on was all wet and sandy by the end! 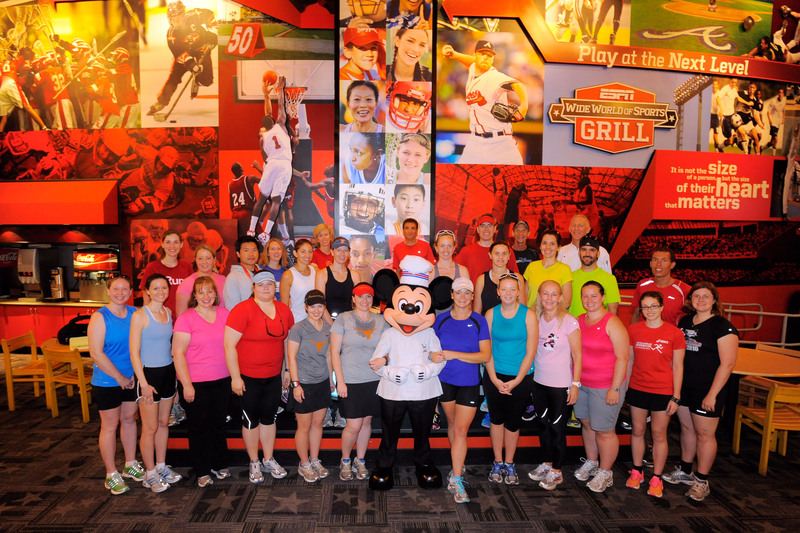 After the run we were taken inside the Wide World of Sports and were met by Disney Chef Gary Jones and Mickey Mouse (all ready to make us a post-run snack in his Chef’s outfit!). Chef Jones is a tri-athlete so he gave some great nutritional tips and then (with the assistance of two of the participants and Mickey) made us Quinoa Birchermuesli (a Swiss Cereal with South American grain), something he said he has for breakfast often before he works out. I love oatmeal and this Quinoa had a very similar texture (in fact you can substitute oatmeal for the quinoa if you want) and had nuts, fresh and dried fruit in it. It was substancial because of everything that was in it and will definitely make a great pre or post run snack. After our quick snack we were given goody bags which had a t-shirt and a small ESPN Wide World of Sports backpack and then we had a chance to pick up our race packets and check out the expo before they opened the doors to the public. Especially as someone participating in their first race it was really exciting and interesting to be a part of the Meet Up, I learned some great running and nutrition tips and met some really great people. The entire event was well organized by the runDisney staff and the opportunity to be a part of it really did add something special to my first race experience, hopefully I’ll get the chance to participate in another in the future! what a cool experience! I love Jeff, he’s so nice. I got to see him when I was setting up the Running Skirts booth at the wine and dine expo. Would love to run with him! I thought I would share my own!